Earn $2.09 in Rewards credit (209 points) What's This? Vittoria's Rubino Pro Speed Road Tire utilizes a G+ Isotech® graphene compound to make a lightweight tire that delivers on grip and speed without losing durability for all-around use. Partnered with fellow Italian company Directa Plus, Vittoria is able to source the highest quality of the extremely lightweight, flexible, yet durable graphene material, and by incorporating it into the Rubino Pro Speed's 3C rubber compound, you get an everyday tire that makes no compromise when it comes to delivering excellent speed, grip, longevity, and flat protection. Folding bead. 180 TPI casing. Love Vittoria tires. Never flatted, and the Pro Speeds are noticeably lighter than the Pro Controls, (which are fantastic wet pavement tires). 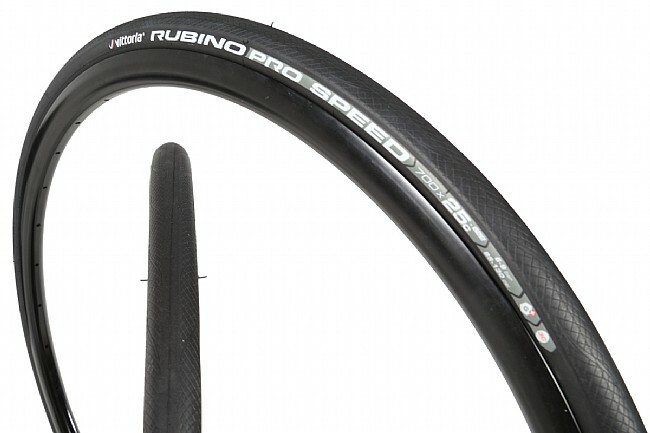 I've been riding on Vittoria Rubino Pro's for years on my road, commuter, and track bikes. Gave these G Speeds a try on my road bike and was amazed by how much smoother the ride was, and better control around tightfast corners. So far no flats in the 9 months I've had them. Ridden mostly on roadtrack 2-3x a week and 2x races. if you like cornering fast...buy this tire. after years on using conti's ( all models) i decided to try something new that nobody in my group uses, so i bought a set of these. keep in mind the group that i ride with are huge fans of anything Specialized, so i am always the odd man out with my 2015 Kestrel Legend. This past weekend our ride was a 142 mile loop in Southern Cali. Long story short, i torched 19 of the 21 MFers in the bunch, 4 had blowouts with their Specialized Turbo Cottons (HA) and the others just bonked (HA HA). I can honestly say it was the Rubinos - fast cornering, ground hugging, Specialized smashing Rubino Pro Speed G. The G stands for Get the F outta here! the only thing i didn't like about the tire is the price, i would like to get a couple more as spares. but my wife says No wait until they go on sale or find a coupon...she is not a cyclist so she doesn't understand. I flatted 5 times in a month. Great tires for clean surface but not in Washington DC area.